Polish People's Republic, during the Cold War. The Polish People's Republic (Polish: Polska Rzeczpospolita Ludowa, PRL) was a communist satellite state in Central Europe that existed from 1947 to 1989, and the predecessor of the modern democratic Republic of Poland. With a population of approximately 37.9 million inhabitants near the end of its existence, it was the most populous state of the Eastern Bloc after the Soviet Union. Having a unitary Marxist–Leninist communist government imposed by the Soviet Union following World War II, it was also one of the main signatories of the Warsaw Pact. The largest city and official capital since 1947 was Warsaw, followed by industrial Łódź and cultural Kraków. The former country covers the history of contemporary Poland between 1952 and 1989 under the Soviet-backed communist government established after the Red Army's release of its territory from German occupation in World War II. The name People's Republic was introduced and defined by the Constitution of 1952 which was based on the 1936 Soviet Constitution. The state's name was the Republic of Poland (Rzeczpospolita Polska) between 1947 and 1952 in accordance with the temporary Constitution of 1947. From 1952, the Sejm exercised no real power, and Poland was regarded as a puppet entity set up and controlled by the Soviet Union. With time, Poland developed into a satellite state in the Soviet sphere of influence. The Polish People's Republic was a one-party state characterized by constant internal struggles for democracy and better living conditions. The Polish United Workers' Party became the dominant political faction, officially making Poland a socialist country, but with more liberal policies than other states of the Eastern Bloc. Throughout its existence, economic hardships and social unrest were common almost in every decade. The nation was split between those who supported the party, those who were opposed to it and those who refused to engage in political activity. Despite this, some groundbreaking achievements have been established during the People's Republic such as rapid industrialization, urbanization of smaller or larger cities and access to free healthcare and education was made available. The birth rate was high and the population almost doubled between 1947 and 1989. The party's most successful accomplishment, however, was the rebuilding of ruined Warsaw after World War II and the complete riddance of illiteracy, which stood at 30% in 1931 and at 2% in 1988. The Soviet Union, an exemplar state, had some influence over both internal and external affairs, and the Red Army was stationed in Poland as in all other Warsaw Pact countries. The Polish People's Army was the main branch of the Armed Forces. The official police organization, responsible for supposed peacekeeping and violent throttling of protests, was renamed Citizens' Militia. 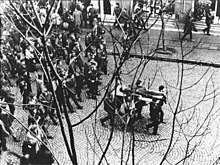 Under the command of the Ministry of Public Security of Poland "UB", the Militia committed serious crimes to maintain the Communists in power, including the harsh treatment of protesters, arrest of opposition leaders and in extreme cases murder, with at least 22,000 people killed by the regime during its rule. As a result, Poland had a high-imprisonment rate but one of the lowest crime rates in the world. This was often fictitiously glorified by the ruling Polish Worker's Party, which described Poland as a safe and educated near-Utopian society. Poland's fate was heavily discussed at the Yalta Conference in February 1945. Joseph Stalin, whose Red Army occupied the entire country, presented several alternatives which granted Poland industrialized territories in the west whilst the Red Army simultaneously permanently annexed Polish territories in the east, resulting in Poland losing over 20% of its pre-war borders. Stalin then imposed upon Poland a Soviet-backed puppet communist government following the war, forcibly bringing the nation into the Soviet sphere of influence. 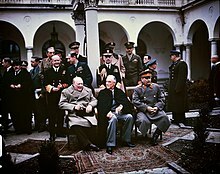 At the Yalta Conference in February 1945, Stalin was able to present his western allies, Franklin Roosevelt and Winston Churchill, with a fait accompli in Poland. His armed forces were in occupation of the country, and his agents, the communists, were in control of its administration. The USSR was in the process of incorporating the lands in eastern Poland which it had invaded and occupied between 1939 and 1941. In compensation, the USSR gave Poland former German populated territories in Pomerania, Silesia, and Brandenburg east of the Oder–Neisse line, plus the southern half of East Prussia. These awards were confirmed at the Tripartite Conference of Berlin, otherwise known as the Potsdam Conference in August 1945 after the end of the war in Europe. Stalin was determined that Poland's new government would become his tool towards making Poland a Soviet puppet state controlled by the communists. He had severed relations with the Polish government-in-exile in London in 1943, but to appease Roosevelt and Churchill he agreed at Yalta that a coalition government would be formed. The communists held a majority of key posts in this new government, and with Soviet support they soon gained almost total control of the country, rigging all elections. In June 1946 the "Three Times Yes" referendum was held on a number of issues—abolition of the Senate of Poland, land reform, and making the Oder–Neisse line Poland's western border. The communist-controlled Interior Ministry issued results showing that all three questions passed overwhelmingly. Years later, however, evidence was uncovered showing that the referendum had been tainted by massive fraud, and only the third question actually passed. Władysław Gomułka then took advantage of a split in the Polish Socialist Party. One faction, which included Prime Minister Edward Osóbka-Morawski, wanted to join forces with the Peasant Party and form a united front against the Communists. Another faction, led by Józef Cyrankiewicz, argued that the Socialists should support the Communists in carrying through a socialist program, while opposing the imposition of one-party rule. Pre-war political hostilities continued to influence events, and Stanisław Mikołajczyk would not agree to form a united front with the Socialists. The Communists played on these divisions by dismissing Osóbka-Morawski and making Cyrankiewicz Prime Minister. Between the referendum and the January 1947 general elections, the opposition was subjected to persecution. Only the candidates of the pro-government "Democratic Bloc" (the PPR, Cyrankiewicz' faction of the PPS, and the Democratic Party) were allowed to campaign completely unmolested. Meanwhile, several opposition candidates were prevented from campaigning at all. Mikołajczyk's Polish People's Party (PSL) in particular suffered persecution; it had opposed the abolition of the Senate as a test of strength against the government. Although it supported the other two questions, the Communist-dominated government branded the PSL "traitors". This massive oppression was overseen by Gomułka and the provisional president, Bolesław Bierut. The official results of the election showed the Democratic Bloc with 80.1 percent of the vote. The Democratic Bloc was awarded 394 seats to only 28 for the PSL. Mikołajczyk immediately resigned to protest this so-called 'implausible result', and fled to the United Kingdom in April rather than face arrest. Later, some historians announced that the official results were only obtained through massive fraud. Government officials didn't even count the real votes in many areas, and simply filled in the relevant documents in accordance with instructions from the Communists. In other areas, the ballot boxes were either destroyed or replaced with boxes containing prefilled ballots. The 1947 election marked the beginning of undisguised Communist rule in Poland, though it was not officially transformed into the Polish People's Republic until the adoption of the 1952 Constitution. However, Gomułka never supported Stalin's control over the Polish Communists, and was soon replaced as party leader by the more pliable Bierut. In 1948, the Communists consolidated their power, merging with Cyrankiewicz' faction of the PPS to form the Polish United Workers' Party (known in Poland as 'the Party'), which would monopolise political power in Poland until 1989. In 1949, Soviet Marshal Konstantin Rokossovsky became Polish Minister of National Defence, with the additional title Marshal of Poland, and in 1952 he became Deputy Chairman of the Council of Ministers (deputy premier). Over the coming years, private industry was nationalised, the land seized from the pre-war landowners and redistributed to the peasants, and millions of Poles were transferred from the lost eastern territories to the lands acquired from Germany. Poland was now to be brought into line with the Soviet model of a "people's democracy" and a centrally planned socialist economy. The government also embarked on the collectivisation of agriculture, although the pace was slower than in other satellites: Poland remained the only Soviet bloc country where individual peasants dominated agriculture. Through a careful balance of agreement, compromise and resistance — and having signed an agreement of coexistence with the communist regime — cardinal primate Stefan Wyszyński maintained and even strengthened the Polish church through a series of failed government leaders. He was put under house arrest from 1953 to 1956 for failing to punish priests who participated in anti-government activity. Bierut died in March 1956, and was replaced with Edward Ochab, who held the position for seven months. In June, workers in the industrial city of Poznań went on strike, in what became known as Poznań 1956 protests. Voices began to be raised in the Party and among the intellectuals calling for wider reforms of the Stalinist system. Eventually, power shifted towards Gomułka, who replaced Ochab as party leader. Hardline Stalinists were removed from power and many Soviet officers serving in the Polish Army were dismissed. This marked the end of the Stalinist era. In 1970, Gomułka's government had decided to adopt massive increases in the prices of basic goods, including food. The resulting widespread violent protests in December that same year resulted in a number of deaths. They also forced another major change in the government, as Gomułka was replaced by Edward Gierek as the new First Secretary. Gierek's plan for recovery was centered on massive borrowing, mainly from the United States and West Germany, to re-equip and modernize Polish industry, and to import consumer goods to give the workers some incentive to work. While it boosted the Polish economy, and is still remembered as the "Golden Age" of socialist Poland, it left the country vulnerable to global economic fluctuations and western undermining, and the repercussions in the form of massive debt is still felt in Poland even today. This Golden Age came to an end after the 1973 energy crisis. The failure of the Gierek government, both economically and politically, soon led to the creation of opposition in the form of trade unions, student groups, clandestine newspapers and publishers, imported books and newspapers, and even a "flying university." On 16 October 1978 the Archbishop of Kraków, Cardinal Karol Wojtyła, was elected Pope, taking the name John Paul II. The election of a Polish Pope had an electrifying effect on what had been, even under Communist rule, one of the most devoutly Catholic nations in Europe. Gierek is alleged to have said to his cabinet, "O God, what are we going to do now?" or, as occasionally reported, "Jesus and Mary, this is the end". When John Paul II made his first papal tour of Poland in June 1979, half a million people heard him speak in Warsaw; he did not call for rebellion, instead encouraged the creation of an "alternative Poland" of social institutions independent of the government, so that when the next crisis came, the nation would present a united front. A new wave of strikes undermined Gierek's government, and in September Gierek, who was in poor health, was finally removed from office and replaced as Party leader by Stanisław Kania. However, Kania was unable to find an answer for the fast-eroding support of communism in Poland. Labour turmoil led to the formation of the independent trade union Solidarity (Solidarność) in September 1980, originally led by Lech Wałęsa. In fact, Solidarity became a broad anti-communist social movement ranging from people associated with the Roman Catholic Church, to members of the anti-stalinist left. By the end of 1981, Solidarity had nine million members—a quarter of Poland's population and three times as many as the PUWP had. 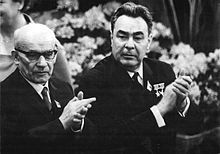 Kania resigned under Soviet pressure in October and was succeeded by Wojciech Jaruzelski, who had been Defence minister since 1968 and Premier since February. On 13 December 1981, Jaruzelski proclaimed martial law, suspended Solidarity, and temporarily imprisoned most of its leaders. This sudden crackdown on Solidarity was reportedly out of fear of Soviet intervention (see Soviet reaction to the Polish crisis of 1980–81). The government then disallowed Solidarity on October 8, 1982. Martial law was formally lifted in July 1983, though many heightened controls on civil liberties and political life, as well as food rationing, remained in place through the mid-to-late-1980s. Jaruzelski stepped down as prime minister in 1985 and became president (chairman of the Council of State). This did not prevent Solidarity from gaining more support and power. Eventually it eroded the dominance of the PUWP, which in 1981 lost approximately 85,000 of its 3 million members. Throughout the mid-1980s, Solidarity persisted solely as an underground organization, but by the late 1980s was sufficiently strong to frustrate Jaruzelski's attempts at reform, and nationwide strikes in 1988 were one of the factors that forced the government to open a dialogue with Solidarity. From 6 February 6 to 15 April 1989, talks of 13 working groups in 94 sessions, which became known as the "Roundtable Talks" (Rozmowy Okrągłego Stołu) saw the PUWP abandon power and radically altered the shape of the country. In June, shortly after the Tiananmen Square protests in China, the 1989 Polish legislative election took place, Poland's first partially-free election in eight decades. Much to its own surprise, Solidarity took all contested (35%) seats in the Sejm, the Parliament's lower house, and all but one seat in the fully free elected Senate. Solidarity persuaded the Communists' longtime satellite parties, the United People's Party and Democratic Party, to throw their support to Solidarity. This all but forced Jaruzelski, who had been named president in July, to appoint a Solidarity member as prime minister. Finally, he appointed a Solidarity-led coalition government with Tadeusz Mazowiecki as the country's first non-Communist prime minister since 1948. On 10 December 1989, the statue of Vladimir Lenin was removed in Warsaw by the PRL authorities. The Parliament amended the Constitution on 29 December 1989 to formally restore democracy, the rule of law and civil liberties. This began the Third Polish Republic, and served as a prelude to the fully democratic elections of 1991—only the third free election ever held in Poland. The PZPR was finally disbanded on January 30, 1990, even if Wałęsa could be elected as President only eleven months after. The Warsaw Pact was soon followed on 1 July 1991 and the Soviet Union ceased to exist in December 1991. On 27 October 1991, the first entirely free Polish parliamentary elections since the 1920s took place. This completed Poland's transition from a communist party rule to a Western-style liberal democratic political system. The last post-Soviet troops left Poland on 18 September 1993. After ten years of democratic consolidation, Poland joined OECD in 1996, NATO in 1999 and the European Union in 2004. The government and politics of the Polish People's Republic were governed by the Polish United Workers' Party (Polska Zjednoczona Partia Robotnicza, PZPR). Despite the presence of two minor parties, the United People's Party and the Democratic Party, the country was generally reckoned by western nations as a one-party state because these two parties were supposedly completely subservient to the Communists and had to accept the PZPR's "leading role" as a condition of their existence. It was dependent on the USSR to the extent of being its satellite state. From 1952 the PRP's highest law was the Constitution of the Polish People's Republic, and the Polish Council of State replaced the presidency of Poland. Elections were held on the single lists of the Front of National Unity. During the PRL's existence, it maintained relations not only with the Soviet Union, but several communist states around the world. It also had friendly relations with the United States, United Kingdom, France, and the Western Bloc as well as the People's Republic of China. PRL's relations with Israel were on a fair level following the aftermath of the Holocaust. In 1947, the PRL voted in favor of the United Nations Partition Plan for Palestine, which lead to Israel's recognition by the PRL on 19 May 1948. However, by the Six-Day War, it severed diplomatic relations with Israel in June 1967 and supported the Palestine Liberation Organization which recognized the State of Palestine on 14 December 1988. In 1989, PRL restored relations with Israel. The PRL participated as a member of the UN, the World Trade Organization, the Warsaw Pact, Comecon, International Energy Agency, Council of Europe, Organization for Security and Co-operation in Europe, International Atomic Energy Agency, and Interkosmos. Poland suffered tremendous economic losses during World War II. In 1939, Poland had 35.1 million inhabitants, but the census of 14 February 1946 showed only 23.9 million inhabitants. (The difference was partially the result of the border revision.) The losses in national resources and infrastructure amounted to 38%. Compared to Western European nations, including Germany, Poland was still mostly an agrarian country. The implementation of the immense tasks involved with the reconstruction of the country was intertwined with the struggle of the new government for the stabilisation of power, made even more difficult by the fact that a considerable part of society was mistrustful of the communist government. The occupation of Poland by the Red Army and the support the Soviet Union had shown for the Polish communists was decisive in the communists gaining the upper hand in the new Polish government. Poland was under Soviet control, both directly (Red Army, NKVD, deportations to the SU) and indirectly (NKVD created the Polish political police UB). As control of the Polish territories passed from occupying forces of Nazi Germany to the subsequent occupying forces of the Soviet Union, and from the Soviet Union to the Soviet-imposed puppet satellite state, Poland's new economic system was forcibly imposed and began moving towards a radical, communist centrally planned economy. One of the first major steps in that direction involved the agricultural reform issued by the Polish Committee of National Liberation government on 6 September 1944. All estates over 0.5 km2 in pre-war Polish territories and all over 1 km2 in former German territories were nationalised without compensation. In total, 31,000 km2 of land were nationalised in Poland and 5 million in the former German territories, out of which 12,000 km2 were redistributed to peasants and the rest remained in the hands of the government (Most of this was eventually used in the collectivization and creation of sovkhoz-like State Agricultural Farms "PGR"). However, the collectivization of Polish farming never reached the same extent as it did in the Soviet Union or other countries of the Eastern Bloc. Nationalisation began in 1944, with the pro-Soviet government taking over industries in the newly acquired territories along with the rest of the country. As nationalization was unpopular, the communists delayed the nationalization reform until 1946, when after the 3xTAK referendums they were fairly certain they had total control of the state and could deal a heavy blow to eventual public protests. 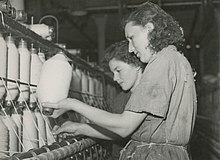 Some semi-official nationalisation of various private enterprises had begun also in 1944. In 1946, all enterprises with over 50 employees were nationalised, with no compensation to Polish owners. The Allied punishment of Germany for the war of destruction was intended to include large-scale reparations to Poland. However, those were truncated into insignificance by the break-up of Germany into East and West and the onset of the Cold War. Poland was then relegated to receive her share from the Soviet-controlled East Germany. However, even this was attenuated, as the Soviets pressured the Polish Government to cease receiving the reparations far ahead of schedule as a sign of 'friendship' between the two new communist neighbors and, therefore, now friends. Thus, without the reparations and without the massive Marshall Plan implemented in the West at that time, Poland's postwar recovery was much harder than it could have been. During the Gierek era, Poland borrowed large sums of Western money. This changed in the late 1970s however, and fact that the West would no longer grant Poland credit meant that living standards began to sharply fall again as the supply of imported goods dried up, and as Poland was forced to export everything it could, particularly food and coal, to service its massive debt, which would reach US$23 billion by 1980. By 1978, it was therefore obvious that eventually the regime would again have to raise prices and risk another outbreak of labor unrest. During the chaotic Solidarity years and the imposition of martial law, Poland entered a decade of economic crisis, officially acknowledged as such even by the regime. Rationing and queuing became a way of life, with ration cards (Kartki) necessary to buy even such basic consumer staples as milk and sugar. Access to Western luxury goods became even more restricted, as Western governments applied economic sanctions to express their dissatisfaction with the government repression of the opposition, while at the same time the government had to use most of the foreign currency it could obtain to pay the crushing rates on its foreign debt. In response to this situation, the government, which controlled all official foreign trade, continued to maintain a highly artificial exchange rate with Western currencies. The exchange rate worsened distortions in the economy at all levels, resulting in a growing black market and the development of a shortage economy. The only way for an individual to buy most Western goods was to use Western currencies, notably the U.S. dollar, which in effect became a parallel currency. However, it could not simply be exchanged at the official banks for Polish złotys, since the government exchange rate undervalued the dollar and placed heavy restrictions on the amount that could be exchanged, and so the only practical way to obtain it was from remittances or work outside the country. An entire illegal industry of street-corner money changers emerged as a result. The so-called Cinkciarze gave clients far better than official exchange rate and became wealthy from their opportunism albeit at the risk of punishment, usually diminished by the wide scale bribery of the Militia. As Western currency came into the country from emigrant families and foreign workers, the government in turn attempted to gather it up by various means, most visibly by establishing a chain of state-run Pewex and Baltona stores in all Polish cities, where goods could only be bought with hard currency. It even introduced its own ersatz U.S. currency (bony PeKaO in Polish). This paralleled the financial practices in East Germany running its own ration stamps at the same time. The trend led to an unhealthy state of affairs where the chief determinant of economic status was access to hard currency. This situation was incompatible with any remaining ideals of socialism, which were soon completely abandoned at the community level. In this desperate situation, all development and growth in the Polish economy slowed to a crawl. Most visibly, work on most of the major investment projects that had begun in the 1970s was stopped. As a result, most Polish cities acquired at least one infamous example of a large unfinished building languishing in a state of limbo. While some of these were eventually finished decades later, most, such as the Szkieletor skyscraper in Kraków, were never finished at all, wasting the considerable resources devoted to their construction. Polish investment in economic infrastructure and technological development fell rapidly, ensuring that the country lost whatever ground it had gained relative to Western European economies in the 1970s. To escape the constant economic and political pressures during these years, and the general sense of hopelessness, many family income providers traveled for work in Western Europe, particularly West Germany (Wyjazd na saksy). During the era, hundreds of thousands of Poles left the country permanently and settled in the West, few of them returning to Poland even after the end of socialism in Poland. Tens of thousands of others went to work in countries that could offer them salaries in hard currency, notably Libya and Iraq. After several years of the situation continuing to worsen, during which time the socialist government unsuccessfully tried various expedients to improve the performance of the economy—at one point resorting to placing military commissars to direct work in the factories — it grudgingly accepted pressures to liberalize the economy. The government introduced a series of small-scale reforms, such as allowing more small-scale private enterprises to function. However, the government also realized that it lacked the legitimacy to carry out any large-scale reforms, which would inevitably cause large-scale social dislocation and economic difficulties for most of the population, accustomed to the extensive social safety net that the socialist system had provided. For example, when the government proposed to close the Gdańsk Shipyard, a decision in some ways justifiable from an economic point of view but also largely political, there was a wave of public outrage and the government was forced to back down. The only way to carry out such changes without social upheaval would be to acquire at least some support from the opposition side. The government accepted the idea that some kind of a deal with the opposition would be necessary, and repeatedly attempted to find common ground throughout the 1980s. However, at this point the communists generally still believed that they should retain the reins of power for the near future, and only allowed the opposition limited, advisory participation in the running of the country. They believed that this would be essential to pacifying the Soviet Union, which they felt was not yet ready to accept a non-Communist Poland. In 1981 Poland notified Club de Paris (a group of Western-European central banks) about its insolvency and a number of negotiations of repaying its foreign debt were completed between 1989-1991. The experiences in and after World War II, wherein the large Jewish minority was annihilated by the Nazis, the large German minority was forcibly expelled from the country at the end of the war, along with the loss of the eastern territories which had a significant population of Eastern Orthodox Belarusians and Ukrainians, led to Poland becoming more homogeneously Catholic than it had been. The Polish Anti-Religious Campaign was initiated by the communist government in Poland which, under the doctrine of Marxism, actively advocated for the disenfranchisement of religion and planned atheisation. The Catholic Church, as the religion of most Poles, was seen as a rival competing for the citizens' allegiance by the government, which attempted to suppress it. To this effect the communist state conducted anti-religious propaganda and persecution of clergymen and monasteries. As in most other Communist countries, religion was not outlawed as such (an exception being Communist Albania) and was permitted by the constitution, but the state attempted to achieve an atheistic society. The Catholic Church in Poland provided strong resistance to Communist rule and Poland itself had a long history of dissent to foreign rule. The Polish nation rallied to the Church, as had occurred in neighbouring Lithuania, which made it more difficult for the government to impose its antireligious policies as it had in the USSR, where the populace did not hold mass solidarity with the Russian Orthodox Church. It became the strongest anti-communist body during the epoch of Communism in Poland, and provided a more successful resistance than had religious bodies in most other Communist states. The Catholic Church unequivocally condemned communist ideology. This led to the antireligious activity in Poland being compelled to take a more cautious and conciliatory line than in other Communist countries, largely failing in their attempt to control or suppress the Polish Church. The state attempted to take control of the Polish Orthodox Church (with a membership of about half a million) in order to use it as a weapon against the anti-communist efforts of the Roman Catholic Church in Poland, and it attempted to control the person who was named as Metropolitan for the Polish Orthodox Church; Metropolitan Dionizy (the post-war head of the POC) was arrested and retired from service after his release. Following with the forcible conversion of Eastern Catholics in the USSR to Orthodoxy, the Polish government called on the Orthodox church in Poland to assume 'pastoral care' of the eastern Catholics in Poland. After the removal of Metropolitan Dionizy from leadership of the Polish Orthodox Church, Metropolitan Macarius was placed in charge. He was from western Ukraine (previously eastern Poland) and who had been instrumental in the compulsory conversion of eastern Catholics to orthodoxy there. Polish security forces assisted him in suppressing resistance in his taking control of Eastern Catholic parishes. Many eastern Catholics who remained in Poland after the postwar border adjustments were resettled in Western Poland in the newly acquired territories from Germany. The state in Poland gave the POC a greater number of privileges than the Roman Catholic Church in Poland; the state even gave money to this Church, although it often defaulted on promised payments, leading to a perpetual financial crisis for the POC. Before World War II, a third of Poland's population was composed of ethnic minorities. After the war, however, Poland's minorities were mostly gone, due to the 1945 revision of borders, and the Holocaust. Under the National Repatriation Office (Państwowy Urząd Repatriacyjny), millions of Poles were forced to leave their homes in the eastern Kresy region and settle in the western former German territories. At the same time approximately 5 million remaining Germans (about 8 million had already fled or had been expelled and about 1 million had been killed in 1944-46) were similarly expelled from those territories into the Allied occupation zones. Ukrainian and Belarusian minorities found themselves now mostly within the borders of the Soviet Union; those who opposed this new policy (like the Ukrainian Insurgent Army in the Bieszczady Mountains region) were suppressed by the end of 1947 in the Operation Vistula. The population of Jews in Poland, which formed the largest Jewish community in pre-war Europe at about 3.3 million people, was all but destroyed by 1945. Approximately 3 million Jews died of starvation in ghettos and labor camps, were slaughtered at the German Nazi extermination camps or by the Einsatzgruppen death squads. Between 40,000 and 100,000 Polish Jews survived the Holocaust in Poland, and another 50,000 to 170,000 were repatriated from the Soviet Union, and 20,000 to 40,000 from Germany and other countries. At its postwar peak, there were 180,000 to 240,000 Jews in Poland, settled mostly in Warsaw, Łódź, Kraków and Wrocław. According to the national census, which took place on February 14, 1946, population of Poland was 23,9 million, out of which 32% lived in cities and towns, and 68% lived in the countryside. The 1950 census (December 3, 1950) showed the population rise to 25 million, and the 1960 census (December 6, 1960) placed the population of Poland at 29.7 million. In 1950, Warsaw was again the biggest city, with the population of 804,000 inhabitants. Second was Lodz (pop. 620,000), then Kraków (pop. 344,000), Poznań (pop. 321,000), and Wrocław (pop. 309,000). Females were in the majority in the country. In 1931, there were 105.6 women for 100 men. In 1946, the difference grew to 118.5/100, but in subsequent years, number of males grew, and in 1960, the ratio was 106.7/100. Most Germans were expelled from Poland and the annexed east German territories at the end of the war, while many Ukrainians, Rusyns and Belarusians lived in territories incorporated into the USSR. Small Ukrainian, Belarusian, Slovak, and Lithuanian minorities resided along the borders, and a German minority was concentrated near the southwestern city of Opole and in Masuria. Groups of Ukrainians and Polish Ruthenians also lived in western Poland, where they were forcefully resettled by the authorities. As a result of the migrations and the Soviet Unions radically altered borders under the rule of Joseph Stalin, the population of Poland became one of the most ethnically homogeneous in the world. Virtually all people in Poland claim Polish nationality, with Polish as their native tongue. Konstantin Rokossovsky, pictured in a Polish uniform, was Marshal of the Soviet Union and Marshal of Poland until being deposed during the Polish October in 1956. The Polish People's Army (LWP) was initially formed during World War II as the Polish 1st Tadeusz Kościuszko Infantry Division, but more commonly known as the Berling Army. Almost half of the soldiers and recruits in the Polish People's Army were Soviet. In March 1945, Red Army officers accounted for approximately 52% of the entire corps (15,492 out of 29,372). Around 4,600 of them remained by July 1946. It was not the only Polish formation that fought along the Allied side, nor the first one in the East - although the first Polish force formed in the USSR, the Anders Army, had by that time moved to Iran. The Polish forces soon grew beyond the 1st Division into two major commands - the Polish First Army commanded by Zygmunt Berling, and the Polish Second Army headed by Karol Świerczewski. The Polish First Army participated in the Vistula–Oder Offensive and the Battle of Kolberg (1945) before taking part in its final offensive with the Battle of Berlin. Following the Second World War, the Polish Army was reorganized into six (later seven) main military districts: the Warsaw Military District with its headquarters in Warsaw, the Lublin Military District, Kraków Military District, Lodz Military District, Poznań Military District, the Pomeranian Military District with its headquarters in Toruń and the Silesian Military District in Katowice. Throughout the late 1940s and early 50s the Polish Army was under the command of Polish-born Marshal of the Soviet Union Konstantin Rokossovsky, who was intentionally given the title "Marshal of Poland" and was also Minister of National Defense. It was heavily tied into the Soviet military structures and was intended to increase Soviet influence as well as control over the Polish units in case of war. This process, however, was stopped in the aftermath of the Polish October in 1956. Rokossovsky, viewed as a Soviet puppet, was excluded from the Polish United Workers' Party and driven out back to the Soviet Union where he remained a hero until death. Geographically, the Polish People's Republic bordered the Baltic Sea to the North; the Soviet Union (via the Russian (Kaliningrad Oblast), Lithuanian, Byelorussian and Ukrainian SSRs) to the east; Czechoslovakia to the south and East Germany to the west. After World War II, Poland's borders were redrawn, following the decision taken at the Teheran Conference of 1943 at the insistence of the Soviet Union. Poland lost 77,000 km2 of territory in its eastern regions (Kresy), gaining instead the smaller but much more industrialized (however ruined) so-called "Regained Territories" east of the Oder-Neisse line. The Polish People's Republic was divided into several voivodeships (the Polish unit of administrative division). After World War II, the new administrative divisions were based on the pre-war ones. The areas in the East that were not annexed by the Soviet Union had their borders left almost unchanged. Newly acquired territories in the west and north were organised into the voivodeships of Szczecin, Wrocław, Olsztyn and partially joined to Gdańsk, Katowice and Poznań voivodeships. Two cities were granted voivodeship status: Warsaw and Łódź. In 1950 new voivodeships were created: Koszalin - previously part of Szczecin, Opole - previously part of Katowice, and Zielona Góra - previously part of Poznań, Wrocław and Szczecin voivodeships. In addition, three other cities were granted the voivodeship status: Wrocław, Kraków and Poznań. In 1973, Poland voivodeships were changed again. This reorganization of administrative division of Poland was mainly a result of local government reform acts of 1973 to 1975. In place of three level administrative division (voivodeship, county, commune), new two-level administrative division was introduced (49 small voidships and communes). The three smallest voivodeships: Warsaw, Kraków and Łódź had a special status of municipal voivodeship; the city president (mayor) was also province governor. ^ "What Was the Eastern Bloc?". Retrieved 9 July 2018. ^ Internetowy System Aktow Prawnych (2013). "Small Constitution of 1947" [Mała Konstytucja z 1947] (PDF direct download). Original text at the Sejm website. Kancelaria Sejmu RP. Retrieved 21 February 2015. ^ Rozmaryn, Stefan (1959). "Parliamentary Control of Administrative Activities in the Polish People's Republic". Political Studies. Vol. 7 (1): 70–85. doi:10.1111/j.1467-9248.1959.tb00893.x. ^ Marek, Krystyna (1954). Identity and Continuity of States in Public International Law. Librairie Droz. p. 475. ISBN 9782600040440. ^ a b Rao, B. V. (2006), History of Modern Europe Ad 1789-2002: A.D. 1789-2002, Sterling Publishers Pvt. Ltd.
^ "30 procent analfabetów... - Retropress". retropress.pl. Retrieved 9 July 2018. ^ "Urząd Bezpieczeństwa Publicznego - Virtual Shtetl". sztetl.org.pl. Retrieved 9 July 2018. ^ Rummel, R. J. (1997). Statistics of democide: genocide and mass murder since 1900. Charlottesville, Virginia: Transaction Publishers. ^ Manning, Scott (4 December 2006). "Communist Body Count". ^ Daems, Tom; Smit, Dirk van Zyl; Snacken, Sonja (17 May 2013). "European Penology?". Bloomsbury Publishing. Retrieved 9 July 2018 – via Google Books. ^ Britannica (10 April 2013), Stefan Wyszyński, (1901–1981). Encyclopædia Britannica. ^ Saxon, Wolfgang (29 May 1981). "Wyszynski Fortified Church Under Communist Rule". The New York Times. Retrieved 10 December 2017. ^ Curtis, Glenn E., ed. (1992). "The Society: The Polish Catholic Church and the State". Poland: A Country Study. Federal Research Division of the Library of Congress. Retrieved 10 December 2017 – via Country Studies US. ^ Reuters (11 December 1989). "Upheaval in the East; Lenin Statue in Mothballs". New York Times. ^ Billstein, Reinhold; Fings, Karola; Kugler, Anita; Levis, Billstein (October 2004). "Working for the enemy: Ford, General Motors, and forced labor in Germany during the Second World War". ISBN 978-1-84545-013-7. ^ a b c d Karolina Szamańska (2008). "Sklepy w czasach PRL" (PDF). Portal Naukowy Wiedza i Edukacja. pp. 13, 22–23 / 25. Archived from the original (PDF file, direct download) on 19 October 2014. Retrieved 15 October 2014. ^ Jackson, John E.; Jacek Klich; Krystyna Poznanska (2005). The Political Economy of Poland's Transition: New Firms and Reform Governments. Cambridge University Press. pp. 21–. ISBN 0-521-83895-9. ^ "saksy – Wikisłownik, wolny słownik wielojęzyczny". pl.wiktionary.org. Retrieved 9 July 2018. ^ "Building Export from Socialist Poland: On the Traces of a Photograph - Stadtaspekte". 2 April 2016. Retrieved 9 July 2018. ^ "Agreements concluded with Paris Club | Club de Paris". www.clubdeparis.org. Retrieved 12 December 2017. ^ Cieplak, Tadeusz N. (1969). "Church and State in People's Poland". Polish American Studies. 26 (2): 15–30. JSTOR 20147803. ^ a b Mirek, Agata (2014). "Law as an Instrument of the Communist Authorities in the Fight against Orders in Poland". OL PAN. Teka Komisji Prawniczej: 64–72. Planned atheisation afflicted all areas of activity of monastic communities [...] To victimise clergymen and consecrated people not only provisions of the criminal procedure were used, often violating not only the right for defence, but also basic human rights, allowing to use tortures in order to extort desired testimonies; also an entire system of legal norms, regulating the organisation and functioning of bodies of the judiciary, was used for victimising. Nuns also stood trials in communist courts, becoming victims of the fight of the atheist state against the Catholic Church. The majority of trials from the first decade of the Polish People's Republic in which nuns were in the dock had a political character. A mass propaganda campaign, saturated with hate, led in the press and on the radio, measured up against defendants, was their distinctive feature. ^ a b Dinka, Frank (1966). "Sources of Conflict between Church and State in Poland". The Review of Politics. 28 (3): 332–349. doi:10.1017/S0034670500007130. ^ a b Ediger, Ruth M. (2005). "History of an institution as a factor for predicting church institutional behavior: the cases of the Catholic Church in Poland, the Orthodox Church in Romania, and the Protestant churches in East Germany". East European Quarterly. 39 (3). ^ Clark, Joanna Rostropowicz (2010). "The Church and the Communist Power". Sarmatian Review. 30 (2). ^ a b Wynot, Edward D., Jr. (2002). "Captive faith: the Polish Orthodox Church, 1945–1989". East European Quarterly. 36 (3). ^ "Historical documents detailing Vistula operation to deport 150,000 Polish Ukrainians now online -". 23 May 2017. Retrieved 9 July 2018. ^ Olchawa, Maciej (2 May 2017). "Ghosts of Operation Vistula". Retrieved 9 July 2018. ^ Hafrey., Peter Schneider: Peter Schneider, A West Berliner and Is the Author of the Novelthe Wall Jumper. He Is Writing A Book On Germany After the Wall. This Article Was Translated From the German By Leigh. "IS ANYONE GERMAN HERE? ; A Journey Into Silesia". Retrieved 9 July 2018. ^ "Poland most homogeneous in EU". Retrieved 9 July 2018. ^ "Languages in Poland · Explore which languages are spoken in Poland". languageknowledge.eu. Retrieved 9 July 2018. ^ "Dr J. Pałka: Ludowe Wojsko Polskie wymyka się prostym klasyfikacjom". Retrieved 16 August 2018. ^ Kałużny, Ryszard (2007). "Oficerowie Armii Radzieckiej w wojskach lądowych w Polsce 1945-1956". Zeszyty Naukowe WSOWL (in Polish). AWL (2): 86–87. ISSN 1731-8157. ^ a b "21-26 kwietnia 1945 r. – bitwa pod Budziszynem. Hekatomba 2. Armii Wojska Polskiego". 26 April 2016. Retrieved 16 August 2018. ^ "Śląski Okręg Wojskowy". 14 April 2003. Retrieved 16 August 2018. ^ "POLAND: Child of the People". 21 November 1949. Retrieved 16 August 2018 – via content.time.com. ^ "POLAND: Distrust in the Ranks". 1 July 1957. Retrieved 16 August 2018 – via content.time.com. Ekiert, Grzegorz (March 1997). "Rebellious Poles: Political Crises and Popular Protest Under State Socialism, 1945-89". East European Politics and Societies. American Council of Learned Societies. 11 (2): 299–338. doi:10.1177/0888325497011002006. Kuroń, Jacek; Żakowski, Jacek (1995). PRL dla pocz��tkujących (in Polish). Wrocław: Wydawnictwo Dolnośląskie. pp. 348 pages. ISBN 83-7023-461-5. Wikimedia Commons has media related to Polish People's Republic.